It’s obvious that I like to go out to eat. But it never fails that just because I have a food blog, everyone wants me to pick the place. Why? I, for one, do not like to force my will upon others. Plus, I can be indecisive. So I love it when others pick. But hey, I’m proud to say I picked Oyster House. And then after I picked it, it turned out that it’s the favorite or second favorite restaurant of two of my friends. Why did they not tell me this before? So Oyster House used to be Samson Street Oyster House, before it closed, got a facelift, and renamed itself. I’m not sure what it looked like before, but it sure is sparkly now. There’s a big bar and oyster bar area in the front, along with high tops. The back half is for tables. It’s cool and casual, but not like fish market casual or anything. They do have a full bar, and we did partake. 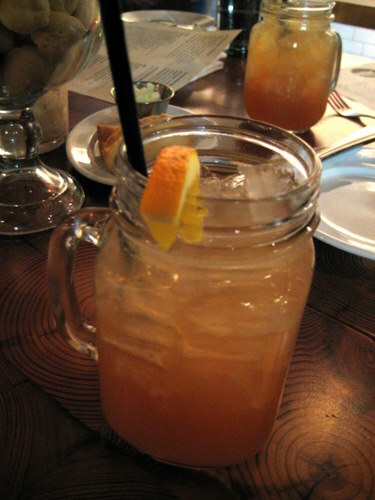 We got some of the famed oyster house punch, but of the non-summer variety… more on that in an upcoming post. They have buck a shuck here, where one oyster is featured as the day’s $1 oyster. This happens weekday nights during happy hour and late on saturday nights. How could I pass this up? We went on thanksgiving weekend, so it was a strange time to go. Because of the lack of people eating out during this time, they actually ended up only having 3 varieties of oysters, period. 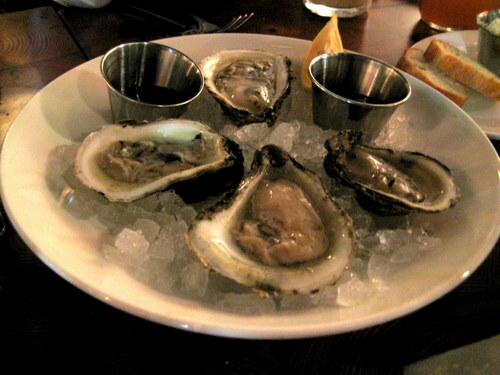 So the ones above were the buck a shuck, some kind of oyster from jersey. I’m not like a raw oyster connoisseur, but I liked these just fine. Listen, you’re talking to a girl who gorged in 10 cent oysters during grad school… oh Alligator Grill of Austin, how I miss you! Ok, back to the oysters… In addition to the buck a shuck, there was another variety from canada and one other one from somewhere else. These were all east coast oysters. See the ones in the back whose shells are more scallop shell shaped? Those are the canadian ones. While R preferred these more expensive canadian ones, T did not like them at all. He said they tasted metallic. So what does one put on raw oysters? Well, it’s up to you. You are provided with lemon, horseradish, cocktail sauce, vinaigrette, and hot sauce. And you can use none, one, more, or any combination of the above. I am not into horseradish, so I first squirted lemon juice on all my oysters. Then I experimented with different combinations of everything. In the end, I decided that cocktail sauce, with a tiny shot of hot sauce was the way to go. The vinaigrette with a tiny shot of hot sauce was the runner-up. Any more than a tiny dash of hot sauce is too much for me. I learned this the hard way. 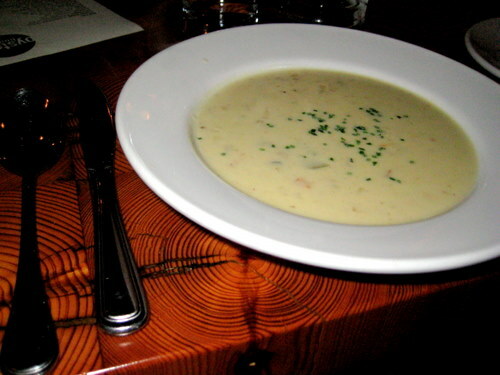 While everyone filled up on raw bivalves alone, I had to try the clam chowder. While it was a good chowder with good flavor, big chunks of fresh clams, and well-cooked potatoes, this chowder is not thick. It’s cotton-pickin watery! And watery chowder is so strange to me. While it tasted great, it just wasn’t chowdery enough for my liking. I like me a thick and hearty chowder that would break plastic spoons! The service was good. Our server was a good sport and she kept up with all our punches. 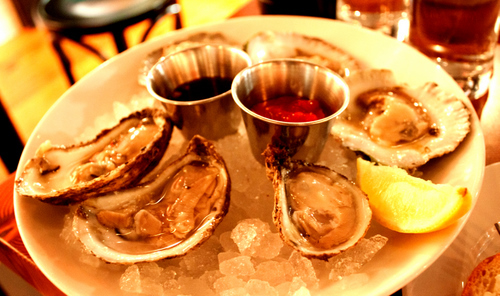 The buck a shuck is only available at the bar or any area with a stool, so if you sit at a table, it does not apply. I definitely recommend taking advantage of this deal! Oh, and afterwards, we went to RAW. Did you know they have lounge in the back that plays music? I had no idea! 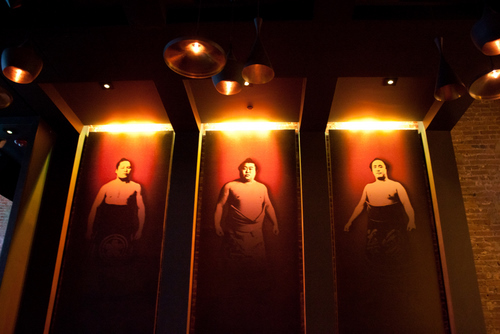 Well, it totally wasn’t my scene at all, but they do have these incredibly giant sumo decorations on the wall and show some strange sumo videos. But if you’re into really expensive bottle service with really terrible music, then this is the lounge for you! This place looks awesome and you really can’t go wrong for $1 oysters! Was the expensive one a Kumamoto?